Nephews of U.S. Marine Corps Cpl. 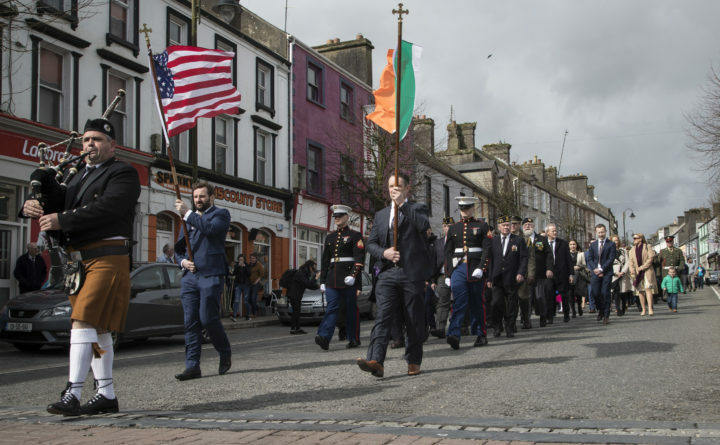 Patrick Gallagher carry the American Flag and Irish Flag during a parade in Ballyhaunis in western Ireland on March 30, 2017, the 50th anniversary of Gallagher's death. Marine Corps Lance Cpl. Patrick Gallagher was just 23 when he was killed in action in DaLoc near Da Nang, Vietnam, just one day before his tour of duty was due to end. In 2013, following an energetic campaign by family, friends — and 10,000 others who signed an online petition — the U.S. Navy announced that the DDG 127 would be named for Gallagher. Construction of the Arleigh Burke-class destroyer began in November at Bath Iron Works. Gallagher was born Feb. 1, 1944, near Ballyhaunis in County Mayo in western Ireland. He immigrated to the United States in 1962. He lived with an aunt on Long Island, New York, and worked and attended law school, Gallagher’s brother said in a 2016 interview on Raidió Teilifís Éireann, Ireland’s National Public Service Broadcaster. In February 1966, he unexpectedly returned to Ballyhaunis for a visit and told his family, including 3-year-old sister Pauline Gallagher, that he had joined the U.S. Marine Corps. Although he had his orders, Gallagher did not tell his family that he would leave for Vietnam just two months later. “He was coming home … not to tell us, but in his own mind to see us all one more time before he went to Vietnam just in case something happened,” Pauline Gallagher told Raidió Teilifís Éireann. On July 18, 1966, Gallagher was with two fellow Marines when Viet Cong soldiers threw a hand grenade into their foxhole, according to the citation for his Navy Cross. “Lance Corporal Gallagher, awake and displaying keen presence of mind, immediately kicked the grenade out of the position where it exploded at a safe distance,” the citation reads. “Another enemy grenade followed and landed in the position between two of his comrades. Without hesitation, in a valiant act of self-sacrifice, Lance Corporal Gallagher threw himself upon the deadly grenade in order to absorb the explosion and save the lives of his comrades. Gallagher had kept his Vietnam tour a secret from his family back in Ireland, routing his letters home through the United States. But at the end of January 1967, his family received a letter telling them that for nine months, Gallagher had been in Vietnam. Gallagher was killed in the line of duty shortly afterward. In the late 1990s, Martin Durkan, who grew up in the same small village as Gallagher and knew of his story, visited the Vietnam Memorial Wall in Washington, D.C., with his mother, who wanted to find Gallagher’s name. “That’s where my interest really started,” Durkan said. Then in 2013, while visiting a friend and Irish pub keeper in Dallas, the group of friends decided, “This is the kind of person they should name a ship after,” Durkan said. Durkan launched an online petition that quickly gained 10,000 signatures. When Sen. Chuck Schumer added his name to a “powerful and growing chorus of supporters from Ballyhaunis to Brooklyn” seeking the honor for Gallagher, Schumer wrote, “The courage and bravery of our fallen soldiers, including those immigrants who have made the ultimate sacrifice even before they have received citizenship, is the American dream manifest. On March 30, 2017, a remembrance day commemorating the 50th anniversary of Gallagher’s death was held in Ballyhaunis. Pauline and her remaining siblings, along with other members of the community, hope to visit Bath to attend the keel-laying ceremony of the future USS Patrick Gallagher, which Durkan said is tentatively scheduled for February 2021, and the launch, by December 2021. Pauline Gallagher said the future USS Patrick Gallagher honors not only her brother, but also all those who served and died in service to the United States and other countries they adopted. Pauline and her two surviving sisters are the official sponsors of the ship, and she said that family members, friends and others in the community of Ballyhaunis hope to attend. “This is one of our own who has received this honor, and we will most definitely not forget him,” she said. She encouraged “the people of Maine” and, in particular, of Bath, to join her in celebrating the ship.